Fiji and Solomon Islands will meet for the first of two friendly matches tomorrow as part of the build up to their 2018 FIFA World Cup Russia™ OFC Stage 3 qualifying matches against New Caledonia and Papua New Guinea, respectively, in June. Although there’s nothing riding on the results, both Fiji and Solomon Islands will be playing for pride, facing each other for the first time since their neck-and-neck clash at the 2016 OFC Nations Cup almost exactly one year ago. The Fijians finished on top in the last encounter – winning 1-0 after a last minute penalty – but a dominant performance in their other group matches pushed Solomon Islands ahead of Fiji in the group ladder and through to the semi-finals. Although, after their two losses to New Zealand, Fiji is out of contention for the 2018 FIFA World Cup Russia™, Solomon Islands are still in the running and the results in their upcoming matches against Papua New Guinea will be crucial for finishing top of their group and continuing on to the OFC Stage 3 final against New Zealand. 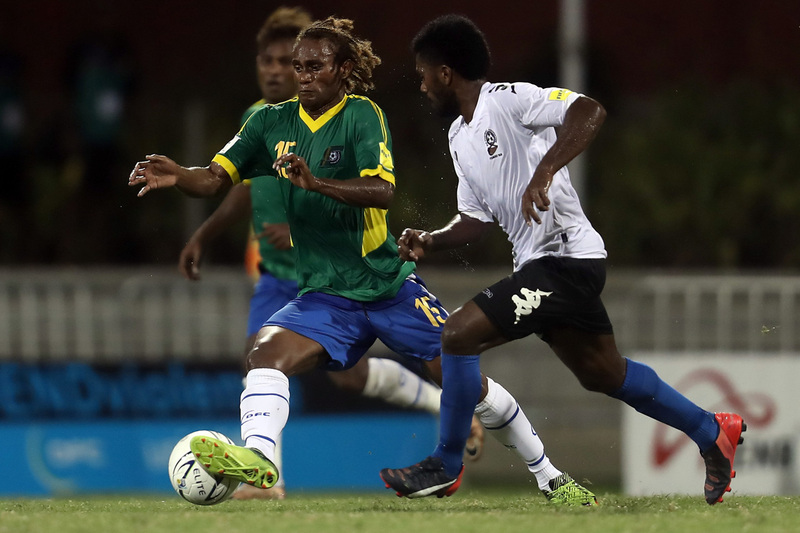 With so much on the line for Solomon Islands in June, and Fiji’s result against New Caledonia determining the Bula Boys movement in the FIFA/Coca Cola World Ranking, both sides will be approaching this week’s friendly matches with full focus. Although his side will be out to avenge last year’s loss, Solomon Islands technical director and acting national team coach Felipe Vega-Arango is not concerned about the scores of the two encounters, focusing on developing combinations in his team and getting an idea of their ability against other national teams in the region. “When we go into friendly matches the most important thing for me is not about the score, it is the team’s chemistry,” he said. “Even though they are friendly matches, they are international games and I know Fiji is going to try to push,” he said. With his focus already switched to the 2022 FIFA World Cup Qatar™, Fiji coach Christophe Gamel is looking forward to using the clashes with Solomon Islands as the first stepping stones in the development of a stronger, more structured Fiji national team. “The first game will be hard because we’ve only had one training session to prepare but we’re not only planning for this game, we are planning for the future as well,” he said. “We have a young team and also talented one. Seven districts are represented here. I’ve kept some senior players and brought in new ones and we need to see the potential of the players and how well they will gel in with each other and read the game.